5/19/2011 – It is difficult to determine the exact date when ChessBase was born. Was it when a science journalist and a future World Champion discussed computer databases? Or when a very talented programmer started to actually write one? We think it was when the two showed the prototype to the World Champion and decided, at his urging, to commercialise the product. That was May 19, 1986. Frederic Friedel — philosopher turned science journalist who befriended Kasparov in 1985, and showed him the potential of an emerging technology: "personal computers". 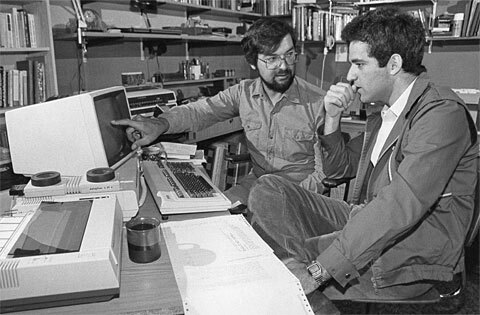 Matthias Wüllenweber — physics student who had single-handedly programmed a chess database on the Atari ST, showed it to Kasparov and, at his urging, founded the company ChessBase together with Frederic. The following is a description of the how it all started – twenty-five years ago. It appeared in Garry Kasparov's autobiography “Child of Change”, Hutchinson 1987. The pictures are from our archives. 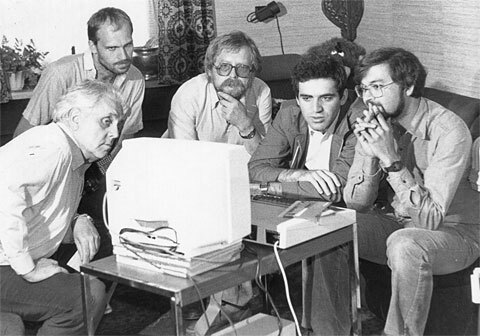 I first became interested in computers when Frederic Friedel, whom I didn't know at the time, sent me a disc in Baku in late-1984. It fascinated me. In 1985, after my controversial interview with Der Spiegel I asked them to take me to see Friedel at Hollenstedt, because I knew he lived somewhere near Hamburg. I had played a 'simul' against the Hamburg team and lost, mainly because I was tired. I hadn't studied the players, who were pretty good, including a grandmaster, and I got into terrible time pressure. I swore to avenge my defeat. When I met Friedel he took me home to meet his wife Ingrid and his sons Martin and Thomas. It was 24 December and I hadn't realised that everything in the country would close down for the Christmas holiday, so they asked me to stay with them. It was my first experience of a Western Christmas, of the tree lit by candles and all the presents arranged neatly around it. According to German custom, a bell rings and the lights go out. Then the tree is lit and everyone exchanges presents, followed by Christmas dinner with every kind of German sausage. Late at night we started playing computer games. The children were phenomenal at these games, especially Thomas, who was only four years old at the time. We played Repton, a sophisticated game that John Nunn, himself a mathematics teacher, had spent many hours trying to solve. Frederic explained to me what computers could do and I told him what I would like them to do for me. Essentially I wanted a bank of chess information that I could draw upon before a match to check my opponent's record. But I didn't know if or how this could be done. 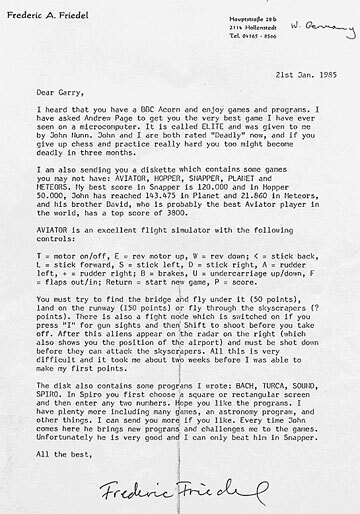 This is the original letter (click to enlarge) sent in January 1985. 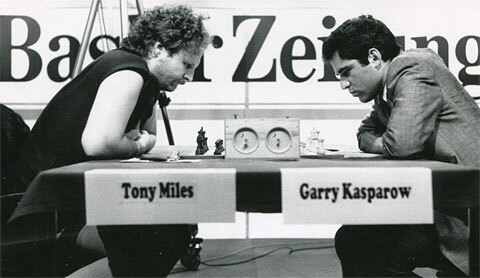 It was addressed to "Garry Kasparov, Baku, USSR", and Frederic never really assumed it would reach the young champion. But arrive it did and Garry visited Fred for the first time when he came to Hamburg in 1985 to play a practice match against GM Robert Hübner. ... and with a modern office computer, an Epson Z80 system with modem and dot matrix printer! 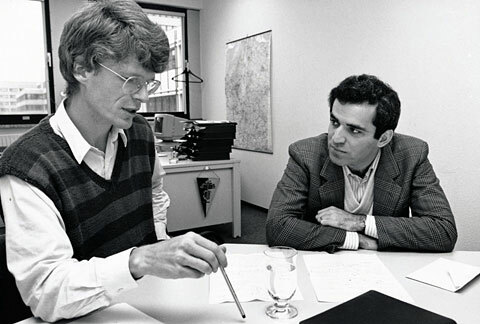 Frederic teamed up with a young German physicist called Matthias Wullenweber, who had already written a chess database. They set this up while I was playing my match against Tony Miles in Basle. When I saw what they had done, I could scarcely believe it. I threw myself back on the bed at the wonder of it. I stayed silent thinking about it for so long that they thought I'd fallen asleep. Then I started typing my games into the computer. Matthias, clearly a genius in his field, was greatly encouraged by my enthusiasm. Matthias Wüllenweber was at the time a physics student at the University of Bonn. 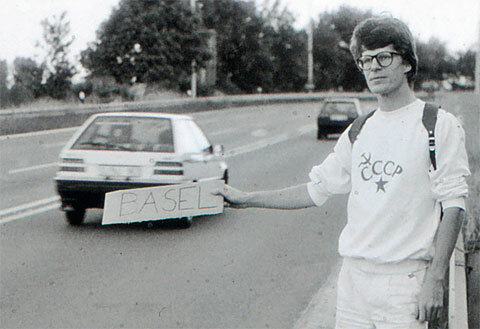 He hitchhiked to Basel, Switzerland, to show his prototype database to Garry Kasparov. In January 1987 I was back to play another ‘simul’ against the Hamburg team. This time I had two days to prepare, so we dug out the names of all the players and checked their records in the computer. It was an eye-opener for me. It took about ten minutes to find 192 games. If I ask my trainers to find me a game, going through the books, it could take days. This time, armed with the information I needed, I beat six of the Hamburg team and drew with the other two. The result, 7-1, was extraordinary. They couldn't believe it. Because I knew their habits, I could lead them into traps. I did the same thing with the Swiss national team later in Zurich. I saw that one player had had a smashing victory, but when I replayed his game on the computer I saw a way in which his opponent could have stopped him. So I tempted him into similar moves. He couldn't believe his luck. I was leading him onto familiar ground where he had won his great victory. Then wham! I closed the trap on him. I regard this facility as the most important development in chess research since printing. I hear that Karpov and Korchnoi have started to make inquiries about this system, and I'm not surprised. It can save many hours of laborious work, bringing you just the game you want to study at the press of a button. You can store six thousand games on a single disc and flick through a game in six or seven seconds. I was delighted to be registered as number one user on this system, called ChessBase. 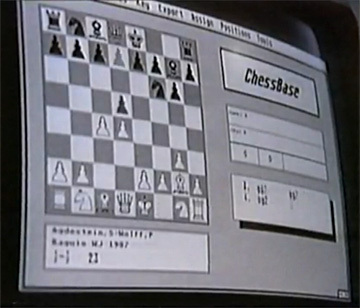 In January 1987, the first version of our chess database program was completed. ChessBase was the name we gave to it, and it came on a black 360 KB diskette which you stuck into your Atari ST. The Atari ST was based on Motorola’s 68000 processor, which ran at a blazing eight MHz. The system had one MByte of RAM, which was a sensational amount at the time. The Atari had a very sharp black-and-white monitor, the kind Macintosh had pioneered. The full system, including monitor and disk drive (but without a hard disk) cost 3,200 DM (German Marks). You could also get an “IBM PC” with a similar performance, but that was three times more expensive. A ten-pack of diskettes cost DM 120. Garry working on an Atari ST. As World Champion he was able to afford a 20 MB hard drive! Today we are able to purchase a useful system for a fifth of the price, and we get a little more value for the money. The processor is many hundreds of times faster, the memory thousands times larger, and you have thirty million times more storage space than we had on one of the four-Dollar diskettes we actually worked with (the first hard disks for the Atari were to have 20 Mbytes). 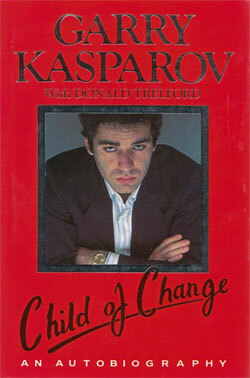 As described in his autobiography above, Kasparov's stint of playing impossibly strong clock simultaneous exhibitions began in 1985, when he took on the Bundesliga team of Hamburg, Germany, a professional squad of eight players, led by GM Murray Chandler on board one. Kasparov knew nothing about most of the other opponents, was tired and got into time trouble. He lost that simul by 3½-4½ — the first and only time this has ever happened to him. He swore to return for revenge. And return he did, in January 1987. 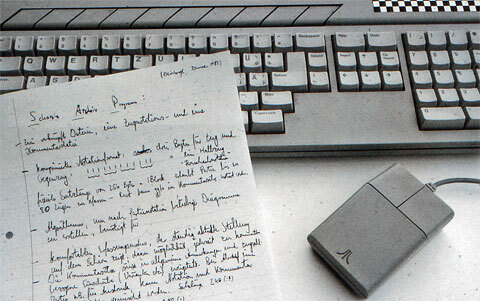 A couple of days before the simul Frederic Friedel and Matthias Wüllenweber handed him the very first copy of a program they had named "ChessBase" – no number behind it, but the serial number of the 3.5" floppy disk was 00001. It contained all available games of Kasparov's opponents, this time from a Hamburg team that was nominally stronger than the one to which he had lost just over a year earlier. 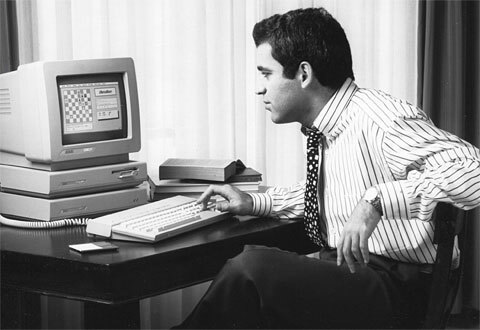 Kasparov spent two days preparing for the opponents, on an early Atari ST with 512 kilobytes of memory and no hard drive. 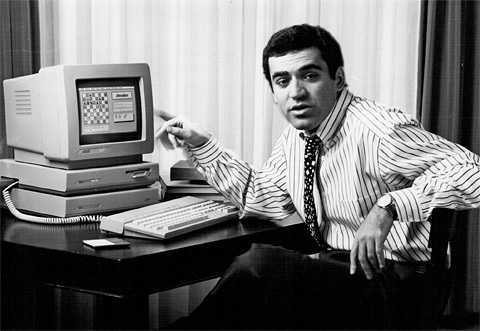 With the home prep the clock simul went differently: Kasparov crushed his opponents 7:1. This experience was so exhilarating that Garry started to do it on a regular basis – and take on stronger and stronger opposition: the Swiss national team, the French (twice), the US junior team, the German junior team, the German Olympiad squad and finally the Argentinians and the Israelis. 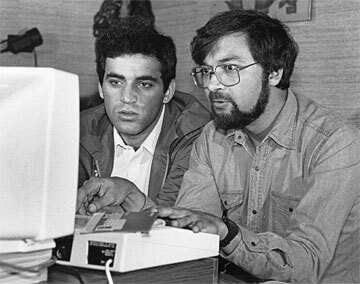 It was always preceded by careful preparation, initially on the Atari, then on PCs when ChessBase migrated to this generation of computers. For more on the subject see: Kasparov's clock simuls. 7/11/2018 – ChessBase co-founder Frederic Friedel was cajoled into a conversation on <a href="https://www.perpetualchesspod.com/">Ben Johnson's Perpetual Chess podcast</a> by summer guest-host Macauley Peterson. Here we bringing you some photos and other visual aids, video highlights and transcription of some of the stories and quotes for posterity. 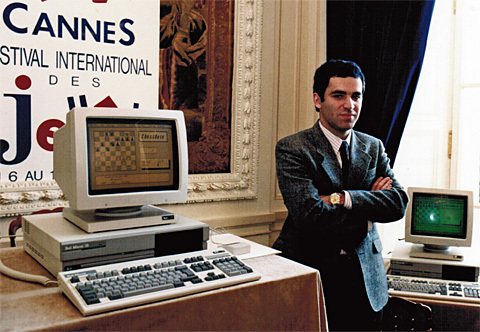 In this first part, Frederic talks about his introduction to chess players, meeting Nigel Short and Garry Kasparov, how he came to know his co-founder, ChessBase CEO Matthias Wullenweber, and got the project off the ground, with Kasparov's help. 3/8/2018 – Gisbert Jacoby was a chess aficionado and multiple Hamburg champion. As a national coach of the Hamburg Chess Federation, he later promoted many Hamburg talents. 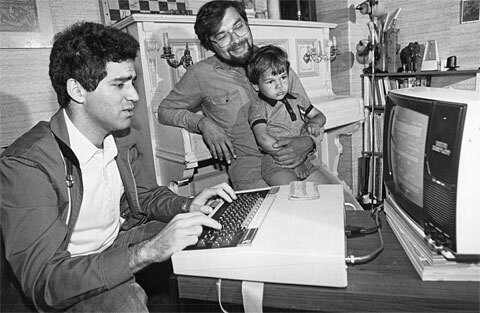 From 1988 to 1999, Jacoby was a Managing Director of ChessBase and set the course for the development of the young company. He was friendly with chess luminaries such as Garry Kasparov and Judit Polgar. Last Thursday he died in Hamburg.